In antiquity Lárissa was the seat of the Aleuad clan, founded by Aleuas, who claimed descent from Heracles. The poet Pindar and the physician Hippocrates, attracted by the Aleuad court, died there. From 344 to 196 Lárissa remained under Macedonia. Rome then made it capital of the reorganized Thessalian League. Larissa is the capital and largest city of the Thessaly region, the fourth-most populous in Greece, according to the population results of municipal units of 2011 census and capital of the Larissa regional unit. It is a principal agricultural centre and a national transport hub, linked by road and rail with the port of Volos, the cities of Thessaloniki and Athenes. Larissa, within its municipality, has 162,591 inhabitants, while the regional unit of Larissa reached a population of 284,325 (in 2011). The urban area of the city, although mostly contained within the Larissa municipality, also includes the communities of giannouli, Platykampos, Nikaia, Terpsithea and several other suburban settlements, bringing the wider urban area population of the city to about 174,012 inhabitants and extends over an area of 572.3 km2. Larissa provides several agricultural products of excellent quality, including many products with designation of origin (PDO) – Feta, Tsipouro (e.g. Tirnavou), lamb, many wines (e.g. Tsantali Rapsani) to name a few – as well as vegetables, legumes, grain, fruits, local traditional pasta (trachanas, chylopites), etc. Furthermore, during the year there are many product festivals (feta cheese festival, wine festival, chestnut festival, cherry festival, etc.) exhibiting local gastronomy and culture. 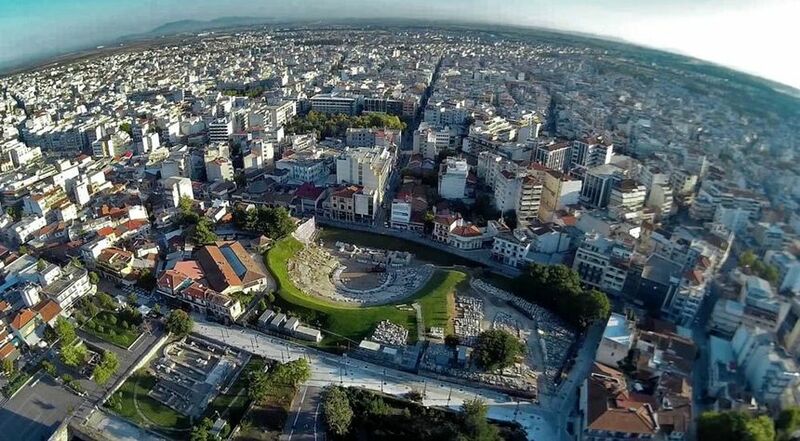 The first ancient theatre of Larissa was built during the first half of the 3rd century BC, during the reign of the king of Macedonia, Antigonus Gonatas, as after the Great Alexander's death, during the Hellenistic era, Thessaly was part of the kingdom of Macedonia. The construction associated with the celebration of theatrical and musical performances, as well as with political activities related to the administration of the Thessalian. The monument has the typical structure of the Hellenistic theater with three key elements: concave – orchestra – scene. The Diachronic Museum of Larissa is built on the hill "Mezourlo" on the southern outskirts of the city on the ring road of Larissa, in an area of 54 acres gradually given by the Municipality of Larissa to the Ministry of Culture. The Museum was inaugurated on November 28, 2015 and now is open to the public. The exhibits come from excavations carried out during the 20th century, so far in the prefectures of Larissa, Trikala and Karditsa, from supplies and donations of objects and antiquities repatriation. Overall the report will be exhibited around 2000 objects. Larissa is full of cultural activities and events, such as amateurish theatrical scenes, a live scene of music bands and choirs, the symphonic orchestra and the philharmonic, very active local culture associations of folklore music and dance, a well known photography club and galleries that promote the very productive local artists. The Municipality of Larissa has also a long tradition in operating District Culture Clubs for arts and crafts for both children and adults, a famous Puppet Troupe – Tiritompa – that operates the only Puppet Museum in Greece and the Municipal School of Ballet that has showcased prominent dancers.